This course is amazing, I mean Dr. Fischer is fantastic, he's unbelievable. He's the best medical clinical teacher of all times! Oh my God, on those cases he takes into a journey that you so enjoy that u even forget urself and never know that the hours are passing. The way he jumps in and out with variable volume coming out of his "fishy" lips will leave u smiling all the time. In that module he explains everything you need to know about murmurs for the Step 2 CK and perhaps for the rest of your medical life! There are 15 questions for the same clinical case scenario which is a lady with cough and hemoptysis + h/o rheumatic fever. He will make the murmurs in his lips and arms, then he'll let you listen to an audio of the murmur and then an audiogram will pop up in a window! I believe doing those 20 modules will let you end up acing the step 2 CK without any doubt. 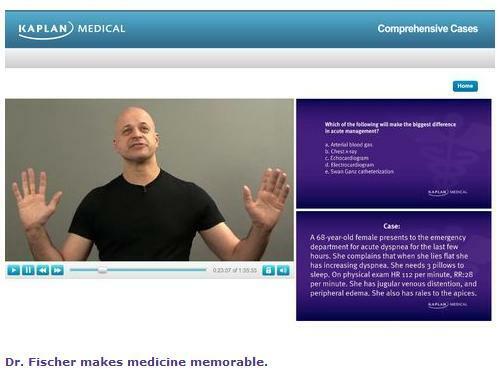 Moreover, this time Kaplan is giving us an online streaming videos! no more looking around for DVDs, no more have-to go to Kaplan center to see the lectures, they are there on the Internet! comprehensive cases by Dr. Conrad,, help!!! dnt u guys think think $200 for 20 cases is too much?? ?its tempting with Fischer taking the cases but still its 200 for just 20...any thoughts about that? Each case lasts about 60 minutes, it's a complete case-based lecture. I think it's adequately priced. what is the duration of these cases? the longest one around 1 hours and 50 min , im not sure but i think it the DM case. thanks for the reply..is it really very helpful for CK? does anybody know how I can find/get the latest versions of all 4 conrad fisher flashcards. Don't know if those available at amazon are the latest editions.